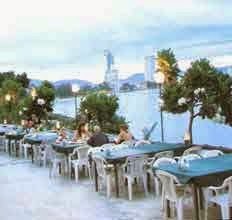 There are numerous restaurants in Hua Hin where you can go and enjoy delicious food. Whatever food you want – Thai, European, Chinese and many other, you get nice restaurants in Hua Hin for that. Not only a large number of restaurants in Hua Hin that amaze the tourists but also the fact that almost every restaurant in Hua Hin are really well-managed and hygienic with nice ambience and excellent service. Many restaurants in Hua Hin serve all kind of food, be it Thai food, European food, seafood or very traditional Thai cuisine while other restaurants in Hua Hin might serve only one particular kind of food. Therefore, you have many choices when it comes to restaurants in Hua Hin. One can just be indecisive when it comes to choosing one restaurant out of plenty of memorable eating place in Hua Hin. Go and try out all the famous restaurants in Hua Hin - there are plenty! Need lots and lots of spices? If this is something that you are not very familiar with, it will be a good change. Indian food is something quite different from European food or Thai food because of spices used in the Indian food. Many dishes are very tasty. 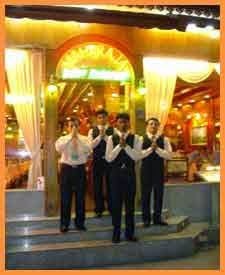 In Hua Hin there are also quite a number of Indian restaurants available. The outstanding ones are Maharaja and Taj Mahal in Naresdamri Rd. Go try it whenever you’re in Hua Hin- you’ll love it! Fast food may be your quick choice sometimes when you are in a hurry or don’t know what to eat or where to go for your meal. There are many places for this kind of food in Hua Hin. What would you like to have? KFC, The Pizza, McDonald’s, Subway, Burger King and what not… Most of them situated in the town centre and you will definitely find them in Hua Hin Market Village too. This is what you cannot afford to miss in Hua Hin. Seafood is a must to try since you’re in the place for it. Numerous restaurants in Hua Hin serve excellent fresh seafood prepared in many styles-Thai or international. You can totally be assured about the freshness of seafood used to prepare those dishes served in all restaurants in Hua Hin. Imagine how yummy it is- your Pad Thai Kung Sod with the freshest prawns brought straight from the sea! What else? - Fish? Crab? Or squid? Everything you want- all fresh and well prepared. Looking for a romantic place? Or a relaxing one? Having delicious food in a beautiful and relaxing place is the wonderful moment one can imagine. Many restaurants in Hua Hin can set you that very mood. Since there are all kinds of food available in restaurants in Hua Hin and there are also all kinds of atmosphere or environment that will make you feel happy and relaxed while eating. What kind of atmosphere you want? - Beautiful and well-laid garden, beachside restaurants, open courtyard decorated with various kind of plants or the luxuriously bedecked air conditioned room. Whatever kind of restaurant-you get it all in Hua Hin. You have a variety of Thai food in almost every restaurant in Hua Hin. Typical Thai cuisine is found in all Thai food restaurants here. You can also try out local food that many restaurants in Hua Hin may suggest to you as their specialties. If you ever find Thai food in restaurants in Hua Hin too spicy, you can always talk to the chef and ask them if they can make Thai food of your style. They will always take the individual requests. Thai food in any restaurant in Hua Hin is not very expensive except those dishes that are prepared with big fish or expensive seafood, etc. There are many dishes of Thai food that you should try out once you come to Hua Hin. Salient examples may be Tom Yam Kung, Pla Krapong, Pad Thai Kung Sod, etc. 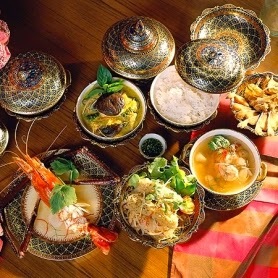 Sea food that is prepared in Thai style is also very interesting to try. Some restaurants in Hua Hin that serve both Thai and European food can even make Thai food in European style or use some ingredients that are generally used in European food. If you are looking for restaurants in Hua Hin that serve you not only the great food but also the lovely atmosphere as well as the wonderful scenery, you’ve got plenty too. There are a large number of beachfront restaurants in Hua Hin that you can choose to go and enjoy both the good food and the amazing environment. To name a few you have Chao lay, Ketsarin, Chom View, The Duke’s, Coco@51, Baan Itsara, and many others. It is a very good idea to go to such beachfront restaurants in Hua Hin. The good ambience will add to your satisfaction on that meal. In many beachfront hotels, resorts and guesthouses, they have also beachfront restaurants to serve you inside your accommodation area. Therefore you’ve got more choices. This might be a new term for many. But dinner on stick isn’t a new concept in Hua Hin. It actually is something like barbecues. 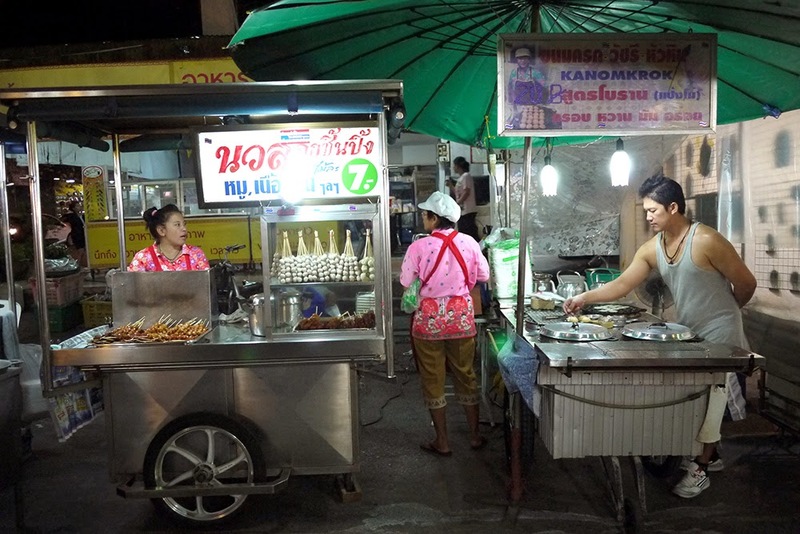 If you walk along some busy roads in Hua Hin you will surely observe those dinner on stick food. It is nothing but grilled pork, chicken, meat ball, or all kinds of seafood on stick. Now choose your favorite! There will be many stalls put up along many roads in Hua Hin. Many people in Hua Hin choose this kind of food for their meal, especially dinner. It’s fun to walk along the road and eat your food. This dinner on stick is also quite cheap and anyone can afford it. But you just need to be careful and make sure that you choose the clean stall for your dinner on stick. Do you eat a lot? It’s nice to know that there are many restaurants in Hua Hin where you can enjoy varieties of buffet (especially for dinner). This will be a perfect choice for those who love eating and those who are quite choosy about food. Buffet restaurants in Hua Hin are mostly known as Ran Moo Kra Ta. Again, you get almost all kind of food in these restaurants in Hua Hin- pork, ham, beef, seafood, meat balls, hotdog and more. But you’ve got to cook it yourself. That’s the fun part. You’ll have to barbecue your food and then start enjoying them as you wish. Varieties of sauce are also available. Not only that there are other kind of (cooked) food put up for you to just take it and …have fun. And you wouldn’t want to miss various kinds of yummy desserts and fruits. Do try this also when you come to Hua Hin! Hua Hin food on the sideKiosks making a living in Thailand could be so simple as loading food on a trolleys and wheel them to the street. Customers are just under way. Meanwhile, some small entrepreneurs take the alternative of getting themselves firmly stationed to kiosks and sell food on sidewalks. Food sold by trolleys and kiosks vary, ranging from seafood noodles, meatball noodles, Pad Thai, grilled chicken, Som Tam, milk-based beverages, and Thai desserts. An item is priced about 20-30 baht. The nightly market fills up Dechanuchit Road with about 100 trolleys and kiosks selling a great variety of food, snacks and desserts every night. Other than those, there is this type of food seller which is quite unique of Thailand, called “Ran Ar-Han Tam Sung” (“cooked to your order”). They are commonly referred to as “Tam Sung” for a less mouthful effect. Tam Sung is presented in the form of shophouses, streetside trolleys and kiosks. As explained by the name, Tam Sung can prepare almost every basic dish. A dish takes only 5-10 minutes to prepare and costs 20-30 baht. Hua Hin soupThe majority of Tam Sungs do not have hardcopy menus for customers to leaf through in the search of their picks. Customers are expected to come up with the orders on their own. The extensive Tam Sung menu features Kao Pad (stir-fried rice), Kai Jeaw (omelet fried in wok), Kai Dao (fried egg), Rad Na (stir-fried noodles in thick gravy), Pad Ga Prao Gai (chicken stir-fried with holy basil), Pad Thai Goong Sod (authentic Thai-style stir-fried noodles with prawns and egg), among others. Dishes cannot feel complete without drinks by their sides. Soft drinks and beers are available in a fair range in Thailand. Non-alcohol drinkers can choose from the usual items like Coca-Cola, Pepsi, Fanta Orange, Fanta Strawberry, and Fanta Cream Soda. Beer lovers can as well sigh with relief. Aside from such local favorites as Singha, Chang, Leo, Tiger, and Heineken, beer lists in food places here also carry imported brands like Franziskaner, Weiss, Kloster, Erdinger Wheat, Erdinger Dunkel, Birra Morretti, Warsteiner and Pilsner. Oh, this following special warning goes out specifically to health watchers who swear the allegiance to drinking water. You may come from countries where tap water is safe enough to be consumed. But, once you are in Thailand, bear in mind the level of hygiene does not apply here. If drinking water is your regular beverage, always get your thirst quenched with properly sealed bottled water. This water-wise talk needs to extend to the cleanliness of ice. Ice served in food places mostly is purveyed by ice factories, and the process of making it, in general, does not appear so hygienic. Plus, you have completely no clue how the water is treated before the freezing. By far we have learned that very few people got sickened by consuming ice. We’re not drawing a conclusion on this subject, though. Iced or not, that’d rather be on your own consideration. Hua Hin 7-elevenThe common array of beverages mentioned above, as well as off-the-list items such as premixed alcoholic beverages, milk, energy drinks, are also sold at cheaper prices than they are in eateries by small household retailers, outlets of retail chain 7-Eleven, hypermarket Tesco Lotus, and supermarket Tesco Lotus Express. So far you probably have noticed the price differences between menus carried by different sorts of eateries. That could prompt you to question whether the quality of the food is actually different. 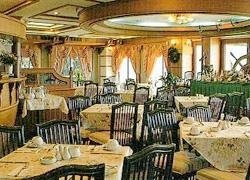 Basically, out of question, decoration and rents makes the main factor of cost-doublers in upscale restaurants. Looking deep into the surface and underneath the image, food in Hua Hin generally is clean and safe to be consumed with no worries. After all, though, be sure to check the cleanliness of the food-preparing area if you want to give a try to a sidewalk food kiosk. Or take an overall look of the dining space before making a decision to seat yourself and your companion in a proper restaurant. Euro/Thai food, German Bakery Deli & internet cafe. Small friendly family run restaurant serving Very good food. Second floor Hua Hin Market Village. 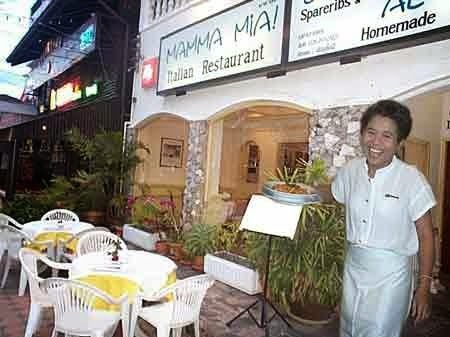 Quality Italian cuisine in the heart of Hua Hin. La Paillote is a French and Thai restaurant combined with three bars open 7 day a week from 11 am . 174/1 Naresdamri road, Hua Hin. Tel: 032-521025. A delicious selection of Danish, French and Thai food. Naresdamri Rd, Hua Hin. Tel: 032-531354. A delicious selection of Italian food. Thai food Restaurant Hua Hin. Fine Italian food and serene settings. Sea food Thai Style . Our tasty menu offers a range of mouth-watering pizza's and pasta dishes along with a number of Western favourites. Great classic subway sandwiches now available in Hua Hin. Thai / Italian Cuisine by the ocean. A delicious selection of Thai style sea food. Pizza, burgers , kebabs and much more! DELIVERY!! !